Oxford University Press, , 208 p.
Over the last few decades, most societies have become more repressive, their laws more relentless, their magistrates more inflexible, independently of the evolution of crime. 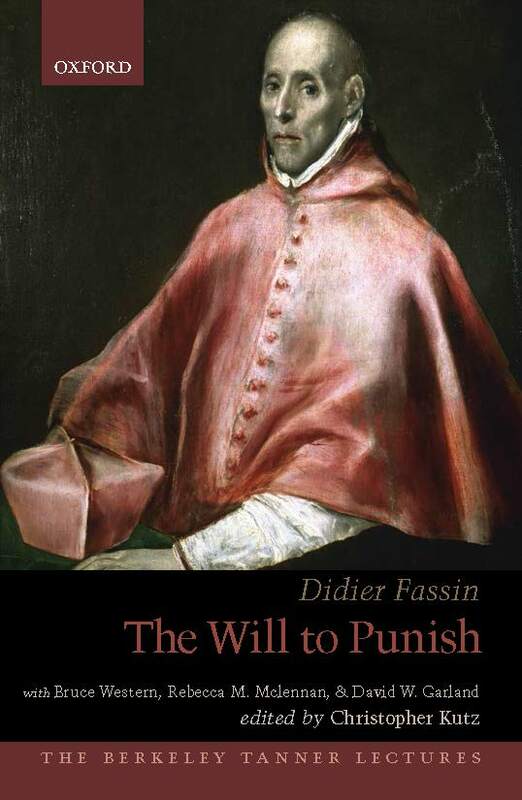 In The Will to Punish, using an approach both genealogical and ethnographic, distinguished anthropologist Didier Fassin addresses the major issues raised by this punitive moment through an inquiry into the very foundations of punishment. What is punishment? Why punish? Who is punished? Through these three questions, he initiates a critical dialogue with moral philosophy and legal theory on the definition, the justification and the distribution of punishment. Discussing various historical and national contexts, mobilizing a ten-year research program on police, justice and prison, and taking up the legacy of Friedrich Nietzsche and Michel Foucault, he shows that the link between crime and punishment is an historical artifact, that the response to crime has not always been the infliction of pain, that punishment does not only proceed from rational logics used to legitimize it, that more severity in sentencing often means increasing social inequality before the law, and that the question, "What should be punished?" always comes down to the questions "Whom do we deem punishable?" and "Whom do we want to be spared?" Going against a triumphant penal populism, this investigation proposes a salutary revision of the presuppositions that nourish the passion for punishing and invites to rethink the place of punishment in the contemporary world. The theses developed in the volume are discussed by criminologist David Garland, historian Rebecca McLennan, and sociologist Bruce Western, to whom Didier Fassin responds in a short essay. Chapter 1: What Is Punishment? Chapter 2: Why Does One Punish? Chapter 3: Who Gets Punished? Didier Fassin is the James Wolfensohn Professor of Social Science at the Institute for Advanced Study in Princeton and a Director of Studies at the École des Hautes Études en Sciences Sociales in Paris. Anthropologist, sociologist and physician, he has worked in Senegal, South Africa, Ecuador, and France in the domain of political and moral anthropology. His recent work includes an ethnography of the French state, based on fieldwork with the police, justice and prison systems, which he conducted as part of his Advanced Grant of the European Research Council, and a theoretical reflection on the public presence of the social science, which he presented in his recipient lecture for the Gold Medal in anthropology at the Swedish Royal Academy of Arts and Sciences. He recently authored Humanitarian Reason: A Moral History of the Present (2011), Enforcing Order: An Ethnography of Urban Policing (2013), Prison Worlds: An Ethnography of the Carceral Condition (2016), and the forthcoming Life: A critical User's Manual (2018). David Garland is Arthur T. Vanderbilt Professor of Law and Professor of Sociology at New York University. His books include The Welfare State: A Very Short Introduction (2016), Peculiar Institution: America's Death Penalty in an Age of Abolition (2010), The Culture of Control: Crime and Social Order in Contemporary Society (2001), Punishment and Modern Society: A Study in Social Theory (1990), and Punishment and Welfare: A History of Penal Strategies (1985; new ed. 2017). Christopher Kutz is C. William Maxeiner Distinguished Professor of Law in the Jurisprudence & Social Policy Program (Berkeley Law School), at U.C. Berkeley. He works in the areas of the philosophy of criminal law and international law, as well as moral and political philosophy. His books include On War and Democracy (2016) and Complicity: Ethics and Law for a Collective Age (2000). Rebecca McLennan is Associate Professor of History at U.C. Berkeley, where she specializes in 19th and 20th century American history. Her books include Becoming America (with David Henkin) (2014), and The Crisis of Imprisonment: Protest, Politics, and the Making of the American Penal State, 1776 - 1941 (2008). Bruce Western is the Daniel and Florence Guggenheim Professor of Criminal Justice Policy at the John F. Kennedy School of Government, and Professor of Sociology, at Harvard University. He is a specialist both in sociological methods and in the sociology of the American punishment system. His books include Punishment and Inequality in America (2006) and Between Class and Market: Postwar Unionization in the Capitalist Democracies (1997). Oxford University Press, The Berkeley Tanner Lectures, 2018, 208 pages.